Man Abducts Woman from Grocery Store, Arrested for Kidnapping, LIVINGSTON, May 22, 2014 - On May 18, 2014, the Polk County Sheriff's Office received a 911 call. An employee at 146 Grocery was stating that a man was abducting a female from the store. Witnesses stated that the white male physically removed the female from the store then put her in his car climbing over her to the driver's seat. A store employee ran from the store to assist the woman. When he reached the car the man drove off (south-bound on US-146). The store employee stated he could see the man hitting the woman, according to Sheriff Kenneth Hammack. The male subject was identified as Donald Gail Vancamp, 31, of Livingston. The female subject was identified as Vancamp's girlfriend. According to witnesses, the two were having a dispute over food and money. The woman didn't want to go with Vancamp so he picked her up against her will and forced her to go with him. Deputy Rey Davalos was dispatched to investigate. An investigation turned up witness statements and store video that allegedly caught the incident on camera. A warrant was issued on Donald Gail Vancamp for Kidnapping. 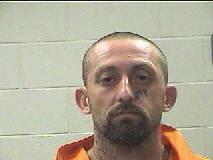 The warrant on Vancamp was executed by Polk County Detectives on May 21, 2014 in Liberty County. Vancamp was transported to the Polk County Jail without incident.